The Vista Centre which houses the Indian Visa and Consular Application Centre has turned to MediaBase Direct (MBD) to improve upon its visitor management and strengthen the building risk assessment. The multi-let office which is ideally located by London’s Heathrow Airport required a digital alternative to its traditional paper books and is now utilising MBD’s e-Reception Book electronic solution. A great number of people pass through the Vista Centre’s reception area every day, which prompted the Facilities Director Neal Chauhan to seek a modern solution to ensure the reception team know who is inside the building in real-time. This tablet-based solution streamlines the check-in process, enhancing the visitor experience and ensures compliance with upcoming data legislation, including GDPR, e-Privacy and PECR. 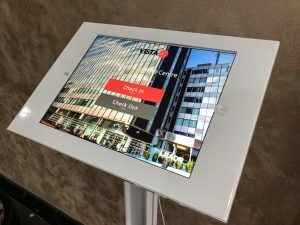 The Vista Centre reported that using e-Reception Book has certainly made a real change when compared to the old paper sign-in book, especially in terms of saving time due to the app’s automated processes. Most importantly, the receptionists can see who is using the facilities in real-time via the clever online dashboard – crucial in the events of an emergency/evacuation. Neal Chauhan said: “The e-Reception Book save a lot of time and effort, and looks a lot better than a standard paper book. Being a Visa Application Centre and a Serviced Office facility, we have a huge turnover of people going through reception, including visitors, visa applicants, contractors and college students. The e-Reception Book provides us with six different visitor categories, all being able to provide and capture different information relevant to the individual’s reason for visit. The bright and large screened iPad Pro’s invite visitors to check-in and sets a modern first appearance to all”. “The e-Reception Book is extremely simple to use and has become an invaluable tool for us. The system automatically sends a welcome email with vital, customisable content such as fire and safety information to visitors. Furthermore, when a guest checks out, a ‘thank you for coming’ email is generated”. MBD Digital Marketing Manager, Laurence Bohmer said: “Our e-Reception Book is becoming indispensable for all businesses who must meet strict new EU GDPR data protection legislation criteria”. MBD, a DMA approved company is based in London and Hampshire, and have been delivering database and digital solutions for more than 21 years. The firm builds, design and develop mobile and web-based products and solutions for a wide range of clients.